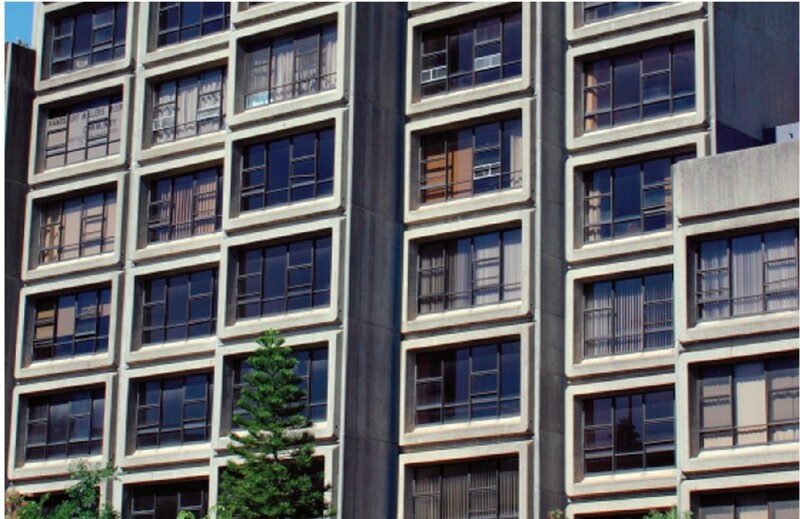 The NSW government continues with its plan to drive public housing out of Millers Point. John McInerney discusses a new study that finds a mixed community in Millers Point will have better economic outcomes for NSW than selling the housing. There are still angels in the consulting world as the Millers Point community found, with the receipt of a pro bono consultants’ report from SGS Economics and Planning Pty Limited, one of Australia’s leading researchers into the economics of community development. Initially, SGS were approached by the Millers Point Community Working Party, to investigate the government’s current plans for a standard consultant’s fee. The Working Party, a coalition of three community groups, was spontaneously generated after the announcement on the 19th March 2014 from Family and Community Services Minister Prue Goward that all 293 government-owned properties, including the Sirius building, would be sold on the private market over the next two years. The government had previously promised to consult with the local community before making a decision. That promise was broken, leading to a great deal of community fear and anguish, and the charge that a policy of “social cleansing” was under way. SGS took the brief but surprisingly, changed the rules half-way through the study when their staff became convinced of the social importance of the results. They believe their recommendations needed to be presented as totally independent with no hint of bias towards any source of funds, and therefore the study was offered to the community on a pro bono basis. As can be imagined the Working Party were excited by this turn of events, and were more than happy to step back from any involvement with the Study, confident that their opposition to the government’s plan would be vindicated. On completion of the report in July, SGS offered the Minister, Gabrielle Upton, the opportunity to consider their recommendations without any pressure from media or the community. Accordingly SGS forwarded to her department a copy of the report in late August 2014 which, it is understood, was discussed with the Minister in early September. As of early November, there had been no response – so much for a genuinely sensitive attempt to open up dialogue with the Minister. The report, entitled “Millers Point and The Rocks: an alternative way forward”, has now been made available through the SGS website – Millers Point Final Report pdf, including a summary of the findings – An alternative way forward for social housing in Millers Point and The Rocks. Its recommendations have been fully supported by the Working Party and are summed up in the primary recommendation that the government should aim to achieve a mixed community with a range of private, affordable, social and aged care housing throughout Millers Point. Failing to provide opportunities for people on lower incomes to live in well-serviced, accessible and job-rich areas, like inner Sydney, has an impact on the city’s overall productivity and global competitiveness. Enabling workers on lower incomes to live closer to employment opportunities. This allows them to access a deeper jobs pool within community distance and more easily improve their skills. Making it easier for firms in the inner city to fill lower paid positions, such as cleaners and childcare workers. Providing housing for ‘key workers’ essential to the city’s functioning, such as police, nurses and teachers, which could have an effect on the tourism, hospitality and education sectors. Addressing the mismatch between the locations of cheaper housing and employment in Sydney, which affects lower income families especially women. Maintaining some, rather than all, social housing in the area. The most appropriate properties to retain will be those with low maintenance costs that are purpose-built as social housing. Replace all lost social housing stock within the inner city area, rather than relocating it to areas with poor services and accessibility. Invest in a purpose-built facility to house elderly long-term residents of the area to allow these residents to age in place and maintain their links to the community. Increase the amount of affordable housing in the area to cater for lower-income workers essential to the city’s function. Offer long term leases to the market, rather than selling properties outright. This will allow the NSW government to keep their options open about how to use the properties in the future. The fifty-page report quantifies the costs and benefits of various options and is illustrated with various diagrams illustrating the economic spatial inequality now entrenched across the Sydney metropolitan area. Particularly telling are the graphs showing public housing being available for fewer new people in the face of rising demand. The diagram reproduced here is from the report but was originally sourced from the Audit Office of New South Wales. 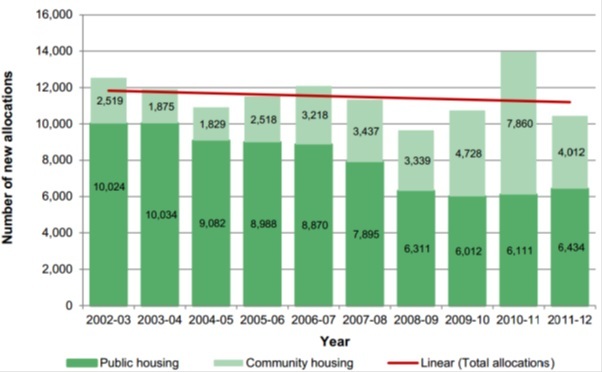 Note: The numbers of newly housed community housing tenants also include transfers between community housing dwellings, which may slightly inflate these numbers.